Dr. Christopher Koebbe was born in Delaware, OH and graduated with honors from Xavier University in Cincinnati, OH. He completed the Air Force ROTC program as distinguished graduate and received his medical degree from the University of Cincinnati. He then pursued neurosurgical residency training at the University of Pittsburgh medical center and ultimately completed this training as well as a postgraduate fellowship in Cerebrovascular and endovascular neurosurgery at Thomas Jefferson University in Philadelphia. He completed over 500 vascular neurosurgical procedures under the guidance of Dr. Robert Rosenwasser during this training. 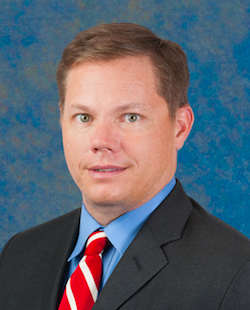 Dr. Koebbe then served as an active duty neurosurgeon in the US Air Force in San Antonio, TX from 2007-2015 completing his service as chief of neurosurgery at the San Antonio Military Medical Center, the largest worldwide referral center for military members and only DoD civilian level 1 trauma center. During his military service Dr. Koebbe deployed in support of Operation Enduring Freedom to Bagram Airbase, Afghanistan as chief of neurosurgery at the theater hospital. He concurrently worked as clinical assistant professor with department of neurological surgery the University of Texas Health Science Center San Antonio. He played a vital role in developing comprehensive stroke and aneurysm care for the south Texas region as well as teaching neurosurgical residents and speaking internationally as invited professor. Dr. Koebbe is a board certified by the American Board of Neurological Surgeons as well as a member of the American Association of Neurological Surgeons. Dr. Koebbe specializes in both cranial and minimally invasive vascular and spinal neurosurgery procedures emphasizing the comprehensive care of brain aneurysms, stroke, tumors, spinal disorders and chronic pain. He is focused on spinal motion preservation as well as spinal disc restoration and outpatient spine surgery. Contact The Florida Spine Institute today. Copyright © 2015, Florida Spine Institute.